Paulette above enjoying her favorite place the Huntington Beach Pier with her photographer friend Jackie Teeple who took this awesome photo of me and my genre is she said in 2012. This is right after I built TotallyInspiredMind. Below at her favorite Barnes and Noble in the periodical section where she learns more than any other section. And Paulette Motzko below taken at The Texas Station Casino in Las Vegas, NV. Photo taken October 2017 by one of my security guard friends. Digital Photo Arts by Paulette L Motzko, PLM Studios. Paulette Le Pore Motzko is a former master piano teacher, transformed, is though by metamorphosis into a professional writer, photographer and digital photo artist, super blogger and marketing consultant. She loves to cook, tell others how to do new things, inspire others, connect people to needed resources, and act as other people’s advocate and information source. She was the CEO & Founder of The Epilepsy Connection and helped people in Orange County, Los Angeles, Riverside County and throughout the USA and 3 other countries for many years. Worked as the Director of the some affiliate the Epilepsy Foundation in Orange County California for a short time. She would have worked there longer but they fired her with a FedEx letter stating that she was helping too many people! She was going for a 501c3 tax status for The Epilepsy Connection, (which she was diagnosed with at age 9) nearly died 5 times in my life and used to be in a wheelchair. But through dedicated research on her part, and finding new medication for epilepsy and in incorporating healthier lifestyle habits, herbal therapy, Mind Body Spirit meditation, music therapy, diet and not associating with people who were adding a huge negative impact in her life Paulette Motzko stands strong and tall and is an advocate for all people who are disabled and has a goal of wanting to see that all people on SSI and SSDI are treated with dignity and respect and can afford more than just their basic needs for the quality life as well. She will always be a disability advocate and is working on three philanthropic ventures that will be monetized soon, will help other people with epilepsy, Alzheimer’s disease and cancer all over the world for many years to come. The thing she loves doing is writing Feature Stories for restaurants and food businesses and shooting photos with her 24 MP Nikon D3200 and Nikon 3300 cameras and Samsung note 4 and creating unique, inspiring, high definition image with her Galaxy Note 4 high definition phablet with a 10 GB external hard drive and countless sophisticated photography apps. Creating what has never been created before is in her DNA and integrity fuels all her life choices. Also, if you would be interested in me writing for your magazine or news paper or doing a story about me contact me at the same email and put in the subject line what it pertains to so it doesn’t end up in the trash or spam folder! Thanks for reading to this point and I hope you follow this and other blogs I created and tune in again! What a wonderful personalized blog! it really conveys you and your passion. I admire that you advocate for epilepsy awareness. I too, am inflicted with an illness (major depressive disorder and Generalized Anxiety Disorder) and wish to advocate for awareness to remove stigma and get easier accessibility to treatment. Perhaps we can merge resources and do what I learned in my Masters Certification class at Chapman University-create-a Triple Win Scenario….I Win, You Win and the best part is Society Wins! Thank you for answering everything I asked. That is rare, and so are you. How do you like it in Florida? I just wanted you to know that at 603 a.m., your story is number 1 on my top 10 list, after my home page!……. and it’s very early still! Lots of readers. If you ever get ideas on something I can work into my site, let me know. Last month 81 countries read it during the course of a month. I could create a page for your works and inspiring words on my site, giving you more exposure. Would you like that? i would love that!!! thank you so much for such kindness and generosity. i will get back to you in two weeks, currently i am studying for a big exam thats preoccupying my time. Mollika, I know you’re gonna ace your test!!!! Thank you for your wonderful compliments about my blog. It has been highly rewarding since it’s creation in 2012. I have met some of the most exceptional people through it too, like YOU! I just updated my about Paulette Motzko page and found a bunch of comments that were pending when I was in the Administrator section of my site. I would love to advocate with you. Are you on Twitter, Instagram or Pinterest? I am Polls Motzko on all three. Thank you for liking my post “Happy Mother’s Day” and the follow of OUR RETIRED LIFE. Have a very blessed day Arlene. Is your last name Sully? So what do I call you? You asked what to call me so I replied that my name is Arlene and I was sorry for not telling you before. You also asked if Sully was my last name. No, Sully is not my last name. It is the name of my cat. I share my blog with my husband David and Sully our Cat. We each have things that we blog about. I have Arlene’s Crochet Gallery, David has a feature about what books he finishes on the Kindle Reader called David’s Kindle Klearing, and Sully tells about his cat adventures on Sully Saturdays. Each of these can be found in the menu bar at the top of the page. Just click on one of the tabs. I hope this clears up the confusion. God bless you and thanks for taking your time to explain all that! The feeling is mutual Rhonda. We are kindred spirits putting good news out into the world. Have a great weekend. You provide great source of inspiration through this website. You are so welcome Pratik Kirve. I am glad you like my inspirational and informative blog too. Hi Paulette and thanks for the follow! I enjoyed your post, Some People Really See the Rain and Others Just Get Wet, or something like that. I probably didn’t get it exactly right, but since it’s been raining the past 2-3 days, the title intrigued me. After reading it, it makes me determined to try this as a writing exercise. You have a lot of accomplishments and interests. I look forward to reading more! Thank you for writing me and I am happy the article made you see your world differently. Nice meeting you through WordPress. Your work is so inspiring. It is great to connect with you. I look forward to reading more about your heart centred and meaningful work. I am enjoying your blog greatly. Which award? 3 are listed. Can you send me an image of what the award looks like? Please and tell me what I need to do than to accept it. What am I supposed to write to accept it? Hopefully not much as I an really busy. I got the email you sent btw. Thank you for the high praise; your words mean the world to me. When people are one of the same Spirit, we just “feel” (know.) You deserve this award. Thank you so much Xena! How did you know that’s just what I needed today! Thank you so much! I especially I’ve what this award signifies. Thank you for the follow. I look forward to reading your blog posts. Thank you so much for the like, follow and re-blog:-) You have a great blog and I see you love photography too. I look forward to re- visiting your blog in the future. I am glad you enjoyed my blogs. They take a lot of time to maintain but are very rewarding. God bless you and thank you so much. I haven’t received that one yet. It is most appreciated. What is your name so I can thank you personally for the award. Is it Marj? It is in my sire now. Perhaps you might find a story that I put up on my sites that you’d like to reblog one day. Have a good night! I’m in bed going to go to sleep as it’s late in Nevada. Have a great day and awesome week Jen! Thank you for following my blog (myschoolofthought.com)! All the best to you. Thanks so much. You have a great blog. Thank you so much. I am honored and I really appreciate that. No worries! I’d love to read your answers! Totally Inspired Mind was nominated nearly two years ago. It was my first award. I I have to refresh my memory on what I’m supposed to do and what questions I gotta answer. I think I’m supposed to nominate 10 more people for the Liebster Award too. Am I correct? Yes! I know that it’s for people with less than 200 followers but I thought why not include anyone I thought was awesome! Thank you so much. What I’d your name? CookingUpaStormWithMissPolly.com has less than 200 followers. You could do it with really any blog, especially seeing that Totally Inspired Mind has already been nominated! Which site is being nominated? I was thinking Totally Inspired Minds! Glad you like my blog. Have a good day. Thanks for stopping by and then following alphabetstory. You are so welcome. You have a really great site. What a kind and wonderful thing to say to me. Thank you Kerry. I appreciate that. You’re so welcome. I love gardening also I haven’t had a place with a big yard in a long time. I used to. It won’t be your last either. Thank you Terri for your very kind words. I appreciate your positive comments so much. I’m so happy you’re so pleased my reblog supposed. That’s what I shoot for when I do that. I am also really happy you liked the blog I created. It is read by people all over the world now, and through it, I have met some wonderful people….like yourself! Thank you so much for your support and reposting! It’s great to find a fellow shutterbug and someone who enjoys cooking. I’m looking forward to reading your blog posts! Definitely let me know of any healthy (low-fat, organic) recipes you would like me to share and I could quote you and mention your blog. People have been asking me for recipes so I’m on the look out. Hi Jackie, it’s so wonderful to meet somebody like you who’s a blogger that sees the big picture of wanting to reblog other people’s material. Thank you for the offer. I will take it. Thank you so much that was like a gift. The more people read my material the more will buy my books when they come out. I’ll look through some of my stuff and also look at my site and feel free to reblog anything tell me so I can look at it. Thanks for following The Write Edge! I hope it edifies and enhances your day. Have a great week! Thanks so much I’m sure we going to try. Hi Paulette…I included you on my list of nominations for the Premio Dardos Award…hope that is okay…smiles…you gave me my first reblog!!! Does that mean I won the award? What does it mean or signify? Hi there…I was nominated for the recognition by witlessdatingafterfifity.wordpress.com There is a brief description of the meaning of it on my site and a longer one on hers…I believe just recognition…I love your site and I wanted to let you know that I appreciate your postings. A big whopping virtual hug from me to you. Tomorrow I will return the favor and take a more in depth look at your blog too. At any rate, thank you for the award and recognition of my efforts on my site. I am happy I gave you your first reblog. It will not be your last. Hey Paulette 🙂 Thanks for following my blog….So happy that you like it! 🙂 & Wow! what a lovely blog you have 🙂 I really loved your blog. Thank you so much and it was my pleasure to share your work on Totally Inspired Mind. Nice to meet you Kajal. Congrats on your success. Sounds like you put a lot of hard work into your site. Best wishes! Thanks Chris. I appreciate your support. Hello Paulette, you have a very kind-hearted blog with lovely pictures, especially of the ocean. I’m so glad to “meet” you! Thank you so much for saying so. It is my labor of love I give the world….because I can. The sea is like a church for me…I place I connect with God and all that is good in the world. I am planning a trip back out to southern CA where I grew up soon. I reloated to the high desert in Nevada and here we are expecting snow! So radically different than CA, but the mountains, nice people from all over the world..& cheap housing are a welcome change. Paulette, please forgive me for shortening your lovely name to Paula in my previous comment – so sorry !! No apologies needed Tracey. The world also knows me by my nickname on Twitter, Instagram & Pinterest: PollyMotzko. Hi Paula – thank you for the Likes on my posts and for following my blog – I appreciate it and I hope theres a little something there to inspire. Just going to have a good browse and read around your site – there are some post titles up top there calling my name. God Bless and thank you !! Paulette, thanks for liking my blog! There’s plenty of good stuff in the pipeline, so please stay tuned. Thanks AnnMarie. I think we would get along really well for a variety of good reasons. Paulette, you are just one busy, productive, creatively flowing woman. Thanks for adding me to your collection. I look forward to reading more of your adventures. I will have to look at your web sites when I go to Starbucks later & claim my free reward. Thanks for visiting my post and following my blog, very happy to return the favour as you look terrific and your blog/blogs look really interesting. It’s good that the world is such a much smaller place these days and we get to catch up people around the world. Thank you for the nice compliment; I really appreciate it. I hope you love my blogs; I am constantly refining them, adding to them and trying to improve them. If you ever get an idea for a story, just tell me. I am very open minded. The greatest things in the world all began with an idea. What is your name & what part of the world are you in? I am Paulette Le Pore Motzko and I am in Las Vegas, NV. Are you on Twitter & Facebook? Or Pinterest or Instagram? Thank you so much for reblogging a post of mine today and for following my blog. I am now following yours as well–it looks so very interesting. I know I will enjoy exploring it carefully in days to come. Best wishes, Mary. I enjoyed myself. Feel free to reblog any of my posts on any of my blogs too. Thank you so much Melody. It means a lot to me because it has been a very draining week. You are most welcome, Paulette! I hope the days ease up for you from this point on. Thank you for connecting and sharing words together. I am touched. It is nice meeting you Adriana. Thanks for the visit, I will definitely be checking out your photo sites, and maybe even a cooking site or two. That is sooooooo wonderful. What is your name? I am located in Las Vegas, NV…where are you? thanks for stopping by my blog mam.. ur blog is a very inspiring one. Thank you so much for stopping by and telling me so. I really appreciate that. All the hours I spend finding stories or writing them and creating the photos I upload…makes it all worthwhile. You have an awesome blog and I love your writing style. I shared your latest story with a friend. Did you see my latest blog post? You and Shannon L. Alder were mentioned in it. I can see all three of us collaborating on a best selling book. Thank you Ma’m for liking and reblogging my post “A Rainbow in the sky” on “Totally Inspired Mind”. This is really special for me coz your like is first like for my blogs & i am the new one on wordpress. You are welcome and it was my pleasure to reblog your A Rainbow in The Sky. I am glad I am your number one blog. I came by totally by accident and fell in love with your site. I am subscribing and hope to see more from you. The piece on Steve Jobs was what sealed the deal. Great style. I search various topics all over the world to try and showcase the best, most interesting content. It is comments like yours Luke, that constantly reaffirm the positive value Totally Inspired Mind has on the world. It began two years ago after I solemn realization that I could no longer care for my mother with acute Alzheimer’s disease. I had wellsprings of inspiration, courage, love and compasion built up in reserves within my soul. I just needed to be left alone, undisturbed, so I could think, focus, concentrate expand on the ideas that have become what you see now with 1,319 followers. Over 50 countries monthly read the site and it just won The Most Lovely Blog Award. I look forward to reading more from you Luke. Thank you for taking your time to write me. Thank you Luke…like out of the bible. What an extraordinary person you are. To know I connected to you, inspired you, taught you a new way of thinking, or empowered you-makes the TIME I INVEST worth it all. I am going on two photo shoots today for the owner of Roly’s Bakery here in Las Vegas, NV. He recently hired me to do his marketing work for his companies. I am so happy Luke. I am leaving tomorrow for southern CA with a good friend of mine & will be seeing her family and my mother. It is an awesome birthday present. Thank you for the reblog Paulette! Your words are inspiring and love all your positivity… Blessings, Estee. Here is looking at you with a smile from Las Vegas, NV. You have a great blog, so it was my pleasure to follow ya! Beautiful name you have btw. I can see it on a book cover! Thank you Rebecca. That is one of the highest compliments anyone could give me. 🙂 I really try. Thanks for the follow. Hope you enjoy the insanity. Your Blog is a feast for the eyes of the body as well as the eyes of the soul, Paulette. Thank you for following Spirituality Without Borders. Polly Motzko my nick name on Twitter, Instagram and Pinterest. That is great CWW. Looking also to read more from you too. Thank you for the nice comments about Totally Inspired Mind. I appreciate it. Hi Many thanks for the re blog. Look forward to checking out your blog. Thank you so much Keshav! I am laying in bed now listening to the birds chirping outside my window and this is a wonderful way to wake up. Thank you for this award and also your wonderful, kind words. Paulette Le Pore Motzko- look on Facebook for me by that name. I am the only one in the world by that name. I guess we are eachother’s inspiration Keshav! Thanks for the reblog, Paulette. Much appreciated! Thanks for your stellar compliments on my blog! Comments like yours are what I dream about getting and what makes all the hours of photo editing and writing worth it…not to mention it is just darn fun-I am finally getting good at it! Which blog are you talking about? Thank you so much! What is your name? We are kindred spirits in this thing called life. It is a real pleasure to meet you via WordPress.com Alicia Calhoun. I really enjoyed your piece about rocket science and your comparisons to passion and a flame etc. You are an amazing writer. Thanks for a reblog of my post. I would appreciate your views and a follow, as I am a beginner. I will take a look at your blog and see what I see. Good luck to you and happy writing Keshav! Hi Paulette. Thank you for visiting and following HoB. Much appreciated! Thanks for the re-blog and the follow at Ink Smeared Page. It’s lovely seeing your blog and how you explore your creativity! Thanks so much for telling me so. I have never heard anyone put it quite like that before. Hi, I just moved from Huntington Beach in January. I lived there 2 years. When I became ill I came back to live with my younger sister. I’ve mended very well. I know I should figure out how to follow, but woe me, I can’t. Thank you so much for this award. This one means the most of all the ones I have recieved because it means I helped people see the light, or enlightened their minds with my thoughts and ideas captured for all time in words and pictures. Hello Amreen…I nominated you for The Light of The World Award too! I accepted the award and put up twelve of my nominations. I didnt know what questions i was supposed to answer, if any. Are there? Can you email the jpg award at TotallyInspiredPC@gmail.com? Wow– you got a LOT of irons in the fire — you’re one busy lady ! Thanks Chris. Figured it would increase the odds something would create a bonfire. Gotta stir them coals once in a while , huh? The about Paulette Le Pore Motzko and about me? I think, all in all, I played the hand God gave me well, even in spite of the odds did pretty well. Thanks Chris…very nice to say. I am a work in progress. I’m afraid I can’t be anywhere near like that with mine. That is great you admire me for my honesty; I think it is a good thing. When a person tells nothing but the truth, they never have to cover up lies. I was married but have been divorced since 2001. I take it you are married? If you are I am harmless…just asking. What fun to come across your blog and your writings! All as a result of your recent decision to follow Learning from Dogs. Thank you for that and delighted to make the connection. Best wishes, Paul! Hello Paul. I love the picture you chose for your profile photo of the gorgeous German Shepherd; looks like my first dog Sampson. He was an awesome dog. Your words are music to my ears as a writer, plus I am a friendly lady…..not to everyone, but to people who are kind, caring and empathetic and care about the big picture. Jean and I are living 4 miles away from Merlin, Oregon. Nearest major city is Grants Pass. Here’s how it came about! I met Jean in Mexico, San Carlos – Sonora, in December, 2007 after having been invited to spend Christmas there by Suzann and Don, Californians who have a second home there. Suzann is the sister of Dan and Dan was my West Coast distributor when I was in business selling a word-processing program for the Commodore ‘PET’ between 1978 and 1986. Dan and I are still close friends. Jean had been living in San Carlos for a number of years with her American husband who had died in 2005. Anyway, Jean and I discovered quickly that we were both born Londoners; born just 23 miles from each other! I moved out with Pharaoh to be with Jean in Mexico in 2008. Then in 2010 we moved to Payson, AZ and subsequently were married. Then in October, 2012 we moved to Oregon because we wanted more land for our dogs. We have 9 dogs, the majority of which are rescue dogs for that was what Jean spent many years doing in Mexico; rescuing Mexican feral dogs and finding homes for them. Paulette, my earlier reply to your query as to where I was located in still ‘awaiting moderation’. Maybe it was because of the included web link? Any time you would like to contribute something to any of my web sites…or have an extraordinary idea…just say the word. Same in my direction. Feel free to browse Learning from Dogs and drop me an email if there’s anything you would like to republish here. I’ll do the same. Thanks for printing awesome recipes. Thank you so much Alma Thadeau! How are you doing Alma? Paulette L Motzko here in southern California. I have to make time to choose the rest of my nominations for The Inner Peace Award and post them. I fractured my wrist so I am learning the true meaning of the words “adapt” and “patience”. I just got my new Dragon software to work, and now it types what I say right into MS Word Professional, which is like history making stuff to a writer with a fractured wrist, or any writer. Look forward to reading more from you and hearing what Ms Thadeau is doing where you are. Hi Paulette. So sorry to hear about your wrist. It definitely must be an exercise in patience. I know it would be for me! Look forward to your posts as well and will definitely be checking out your cooking site. I am always looking for new things to try out! Thanks Alma for cheering my left wrist, arm and hand to a victorious rehabilitation. I hope the world will watch and be happy when I am making Italian meatballs, breads, pizzas and play piano….type again, and hold my camera…all the great stuff I did before last week, without a thought. I will keep you posted how the Dragon software works. I typed my first Word doc using it in the wee hours and haven’t posted it yet. Here it is about six am now and I am typing this with my thumb in bed with the lights out. Was at the hospital changing the large stint on my left arm that keeps it permanently bent-which really bites because it is very awkward to get dressed etc. I was put on Naproxen to kill pain tonight to see if it works better than Tylenol. Did I answer the questions? What were they? I will look in my emails again and remember reading a nice note from you, but not questions. Looking forward to reading more of your great writing and great photos. Keep the hand and wrist prayers coming as I don’t want to be crippled. My worst fear. It really sounds like you are going through an ordeal! So sorry in my delayed response. I hope things have improved since you wrote this, but I guess things may be tough for a while with the large stint. I hope the time passes quickly for you to have a speedy recovery! Things have improved and I have a much more comfortable stint on now that allows my left arm to bend at least. It comes middle way up my forearm. I went to Anaheim Regional Hospital and it took from 730 pm to 1130 pm to do it, but the staff was far more knowledgeable, competent and compassionate than Huntington Beach Hospital by far. I got referrals to see a new neurologist and hand specialist today and will be making apts tomorrow for soonest available. I am so happy I met you and you me. It gives me a feeling of warmth to know you care and others are praying and cheering me on to a speedy and full recovery. Thank you so much my dear. You just gave me what I crave for the most. I hope I get it soon. I didnt forget about writing a blog post for ya. I fractured my left ring finger on the 12th and have had some living situation emergencies that i have had to address that have been occupying all my time. I hope after tomorrow things will ease up for me and things will pay off favorably for me. How have you been there? I’m good! Sad to know about your condition now. I hope and pray that you get well soon. Sure thing! You take care of you and get well soon, then you could surely write for me. I too wish to write in for your blog. Feels so nice to have a friend like you. Stay blessed dear & be happy! Yes Amreen….Nice to know you’re doing good on that end. Pray I get paperwork showing I have been and am the personal care attendant of the man I have been helping over the last two and a half month. I am going to the social service dept today to In Home Supportive Serv to fill the paperwork out and get copies of it to give to the management here. Juan the manager here said he is calling the cops on me tomorrow if he doesnt have the paperwork, which is rediculous and I believe against the law, but what am I gonna do but give him what he wants? I just need to appease everyone, then I can finally take care of myself and go to the doctor etc and get referred to specialists and think of earning money again. My next call will be The Fair Housing Authority on my behalf and my client’s. Hmmm, So how are you today dear? Better? I am alright but have to frantically find a place to stay and make it in to get a second opinion on my finger and see if it really is fractured. The doctor in ER was an idiot and before he knew if it was broken or what happened, he smashed my finger down with some kind of tape, thinking he would get my ring off my swollen bruised finger!…hurt like —–…I had him cut off the ring instead. A second opinion wouldn’t hurt by my primary care doctor and also a referral to someone for physical therapy for it…see how long they think I will need my entire hand wrapped in bandages. I know there is a better way than this. Thanks for asking. I have until Monday to find a place. Feeling better Amreen & thanks so much for asking me. Pretty much over the bad cold and on a mission to find a room to rent so I can turn it into an office to do work in and have a place to sleep. Bare minimum requirements for survival until i get my apartment, which i am going to push every congressman & woman in CA on. Me too more than you. Whatever you would like to write about is fine with me. I don’t mean to intrude on your wonderful blog, I just want to thank you for visiting Cry and Howl and for following my humble site. I’ll add you to my blog roll as well if that’s acceptable. Wishing you and your family a wonderful Christmas! Yes by all means follow my blog. There is no need to ask and tell more people about it too. You aren’t intruding. Looking forward to sharing what we write and post. Thanks for visiting my site, especially because it led me back to you. I appreciate your perspective and expect to be visiting here often. It makes me smile inside to know you appreciate what I take the time to write. I am so pleased you like my perspectives and also that you want to regularly visit my site. Cooking Up a Storm All Over The World! I will have to check out more of your site too. I have many topics I programmed in the reader here and found you by searching on it. Thanks for following and sharing Paulette! I look forward to tagging along on your journey, being inspired, looking at beautiful photos and learning some new tips about cooking too! I’ll be checking in! What is your name and whereabouts do you live in the world? I live in Edgewater, Florida, just south of New Smyrna Beach. I grew up not too far from here. Did I read that you plan on moving? Was diagnosed with PTSD Post Traumatic Stress Disorder due to all the horrible tragic things that happened to me this year. Good things I created of course and everything would be great, if I only had a place to live. Even though I have epilepsy and chose to help my mom & dad pay their mortgage for 13 years after my divorce to the rocket scientist….my sister & bro in law threw me on the street like trash in April 2013. We and the world know I am far from trash but I need a subsidized housing program since I am ssi. Hang in there Paulette! At least you have blogging and a community of people to share with to help you through this tough time. It doesn’t get much rougher than being in the hospital for PTSD. I struggle everyday to look for the good and find my silver lining. Sometimes it is easy to see and other times I feel so overwhelmed and sad that it is hard to speak without breaking down. I’ll be praying for you and hoping that you find a safe and secure living environment when you get out of the hospital. I am out of the hospital since 430am. Will be leaving this hotel in a few hours. A friend of mine is a cab driver who is going to pick me up at noon and take me to my storage unit place where I have 3 storage vaults with my world inside. The extra bags will go in there and my other friend is coming back from Oceanside and will be back this evening. I will be staying with him at his place. This has been strategically thought out a thousand times. I do writing for a client and marketing and the $400 check I was counting on did not come in. Because of this theres no more $ for a hotel and lets say I am pissed with the client. I write stories on CARestaurantShowCase.com and do other writing & photography jobs. Wish they were more plentiful and people said YES quicker! How nice to meet you via Word Press. I have been playing around in the wee hours of the morning trying to give my site here a new look. I played around with a few I really liked, but couldn’t make the other templates do what I wanted them to, so I went back to the iTheme by Apple that I customized. There is an image I found that I wanted to appear as the background image, but haven’t got it to save for some goofy reason. Heading to bed! I do some of my best work in the wee hours and it is quiet with no interruptions. IS your name Magdalena Ratajczak? My ex-husband is -which is where the “Motzko” came from. My maiden name is Le Pore and it is part of who I am so I use both. I will be signing off soon. Thank you so much. 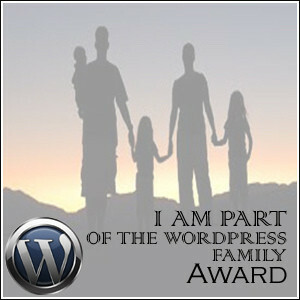 I was recenly nominated for that by someone else and also the Most Influential Blogger Award. I still have to write my acceptance and nominate ten others! Been so busy. Thank you! What is your name so I can mention you as the one who nominated me? Wow! I am honored! Thank you so much! I am following your blog and look forward to reading more by you. I am glad that I made your day by sharing your content with my readers. At last count, in a 30 day period, 73 countries read Totally Inspired Mind: Where Positive Minds Congregate. Thank you so much for the nomination. It is a wonderful way to start my day. I don’t know anything about this award. I will have to read about it, so I can fully appreciate the meaning of it. I was wondering if you could describe to me what it means to be nominated for the award. When I won the Leibster Award, that was for the best blog with under 150 followers. The Sunshine Award was for striving to make the world a better place, etc. That way, when I announce to the 15 writers that I nominated them for the award, I can say “for having a blog that…..” then the award means so much more. There was no description I could find of why the award was given….in other words, the meaning of receiving it. Thanks for taking the time to find the origin and meaning of the award. Now when I nominate my 15 bloggers, I will be able to tell them why I did. I have been working on a photo shoot and a Feature Story with CaRestaurantShowCase.com over the last week. I worked on the acceptance of the award you nominated me for (didn’t forget about it)… And did what I was supposed to do to accept it. I nominated you also for the Dragon Loyalty Award…just wanted you to know. Earning a living always comes first though, Thanks again! I am so happy you took your time to write me. I have to write my acceptance of the Dragon Loyalty Award today and I was chosen as one of the extraordinary blogs on Blog Carnival to write about mentoring. Just need to finish my errands and get “in the minds of fairies” to sit down and create. I am trying to get over a nasty cold and hope the cough syrup will do the trick. Nice to meet you and I look forward to reading more of your stories/posts. Feeling well now after taking care myself and taking some DayQuil for a week. Finally my acceptance of the Dragon Loyalty Award is on Totally Inspired Mind now & my nominations too. Thanks for rebloging and spreading His word! I like the inspirational and encouraging messages behind your posts.! Thank you for visiting my blog and following! It is so great to hear from you Elizabeth. I am glad you love the things I write on here. God bless you Don. I was just looking at all the awards a fellow writer friend had on her page and wishing and hoping they would be mine one day. I guess that is proof you better be careful what you wish for…it might just come true! I nominated you for The Versatile Blogger Award a few days ago, just havent put up the post yet accepting the award from my writer friend Amreen. Hey Paulette, this last two awards was the hardest to select people for, because they are two things I value a lot personally. Happy to accept my award, when you are ready. I am putting up the blog post now here at my favorite Corner Bakery Cafe where I have friends everywhere I look. Thank you again for being one of my friends, fans and supporters of my words and pictures. Thanks so much Amreen. I hope I always do. One of the adjectives I love the most when describing me was “brave”. I never thought of me that was, but when I thought about it, my friend Susan was right. It is amazing what we learn from one another about the world and ourselves. This is for Totally Inspired Mind: Where Positive Minds Congregate..right? I have several web sites so just making sure. I was up until about 4 a.m. writing 15 interesting things about myself and also naming the 15 I chose to nominate for The Versatile Blogger Award. Thanks again for the recognition. It gives me great satisfaction to know the things I write about are received so well by the world. Is your name Pam? I was trying to remember what it was, so I could say my friend — on WordPress nominated me. Paulette Motzko here writing to you from a Marie Calendars that my ex and I used to go to when times were good years ago. The uncle you said to bless, I did because he was dying of cancer but due to my evil sister and brother and law saying horrible things about me before I arrived, I was told to leave there a few days after I got there! My trip to AZ was the trip from hell. I am looking at a few places now in San Bernadino County, after asking questions in City Hall and The Chamber of Commerce. I am going to take a look at a place this week that sounds like it could work out. I hope it does, so I can simply LIVE and have PEACE OF MIND. Thanks for the nice comments Sally & nice to meet you. I am following your blog now on WordPress. I thought it was Murphee the first time, but I can see with the bigger font on my phone your last name is Murphree. I have it memorized now. I’ve nominated you for the Versatile Blogger Award, The rules for the award are to thank the person who nominated you, link back to their blog and nominate 15 bloggers who are worthy to be classified as versatile bloggers. I hate to ask silly questions, but what do you mean by “link back to your blog”? Where do I print the people & blogs I nominate? I will get the hang of this the more I do it! Tomorrow I will carve a huge chunk of time to answer the questions for the Leibster Award, and this one. This one is simpler all you have to do is copy and paste my text to you, then replace the links with your own nominees, that should work, if not check out the help section they give great advice on how to do just about anything. When I get on my computer I will do just that then. Are all the awards mentioned on Word Press somewhere Maria? Cant give you a definite yes or no on that one but check out the help section regarding links, its where I got started. I am not sure why I couldn’t approve your comment. I answered all the questions and created new questions for the nominees. Do I post it on my web site or how do I do it? You post it on your blog site as a new post and copy the url address of your fifteen sites then link them to your post. My blog address should be linked separately. Best of luck. I am not sure that I understand how it all works still?? How can the people I nominate already have won? I am sorry to ask so many questions, but I have to know how to do this right in order to get my award. Who are the nominees aside from me? How do I find it out? Thanks for answering all my many questions Don. Good morning from southern CA. Wow! Thank you Don. I was also nominated for the Leibster Award and have to answer all the questions I was asked. Does your blog have less than 250 people on it? HEy Paulette, seems like you must be doing something right ! My blog has more than 250 people on it … at least you don’t have to answer any questions for this one, well apart from your ten nominees ! Thanks Don. That is exactly what I am trying to do each day when I do my best at everything I do. Thanks again for the recognition. I am supposed to pick 10 nominees for the one you nominated me for? When do I find out if I won and how many others are running for this? Thank you Don. I appreciate the link. Thank you so much. I appreciate your kind words, prayers and thoughts in my direction. I am trying to make enough money to get my things out of the 3 storage vaults and get a place. Any family owned restaurants you know in Orange County or elsewhere-you think would like me to help them market themselves, let me know. Anyone that is a paying referral, I will give a $25 finder’s fee. Yes, I am sure trying to. I would surely appreciate it if God would let me earn some money! Every client I had banked on some Moolah from changed their minds for one reason or another. Good for them but not me! I am hoping that my appointment on Monday is profitable. I am too intelligent to get a job at Wal-Mart-applied 4 times to be a greeter and was told I was too intelligent, too many college degrees etc. If something doesn’t turn up soon, I will simply sell my Anne Klein watch so I am not counting pennies and quarters any more! You are so welcome. What is your name? If you ever have pieces that you think would be nice for Totally Inspired Mind or Photos That Inspire Words, let me know. Are you located in France or where? Paulette, I’m grateful for the reblog, follow and the like “We are Jewels” as well as the opportunity to visit your blog. Many Blessing to you and your new home in Tucson. I’m wondering if I’ll be in Arizona some day because the thought of moving there as entered my mind often. I am ot sure what your name is other than “feelingjoy”. I long for the time when I can feel joy again. I was evicted from my place next to my mom over two weeks ago by my evil brother in law who took the power of attorney thing to a level it was never supposed to be. I have been living out of hotels, maxing out the money that would nave been used as rent money, for my phone and other needs on hotels instead. I am at a Denny’s by my old house talking to people who know me here about the so called “family” I have and trying to think of something good. On the up side, I will be getting a fully furnished one bedroom one bath apartment in Santa Ana, CA but it won’t take place until June 1st. Meanwhile I am awaiting a check that will pay for the ticket for the Greyhound bus outta here and to the kind and loving arms of my uncle in Tucson, AZ, a man who hasn’t forgotten the meaning of the word family. It is so ironic. I have been carrying around a huge statue of the Virgin Mary that wouldn’t fit into a storage vault and somehow gave me peace from hotel to hotel. I know homeless people don’t carry around Nicole Lee suitcases and Nikon camera cases and have two computers. For all good purposes that is what I was made. My great friends who are my family, have said I should sue my sister and brother in law for doing this to me. I have spent over $1000 in storage costs, hotels and the anguish and harassment for over a year. Aside from my mother, who doesn’t know any of this is going on-due to having Alzheimer’s disease, my family has nothing to do with blood lines but in the act words and deeds of the wonderful people I know. I will move on and after June things will be great. But not, it is far from it. Thank you for taking the time to write such a wonderful response to me. At this time it means the world to me. Are you also in AZ? You’re welcome. No, I’m not in Arizona. I’m in Texas. Many times I often think about living somewhere else (another state) and or perhaps travel. Maybe both or one of them are in my future.